With the kick of southwestern flavors, you’ll never know how healthy these stuffed mushrooms are. Last week, I was racking my brain to think of a new appetizer to add to my arsenal, perhaps something that could also double as a side dish at a summer barbecue. Stuffed mushrooms have been a favorite of mine for years but, as I’ve been trying to eat more healthfully over the past 8 months or so, I steered away from these appetizers that often laden with cheese, cream cheese or butter. Tired of missing out, I came up with my own, healthy version. 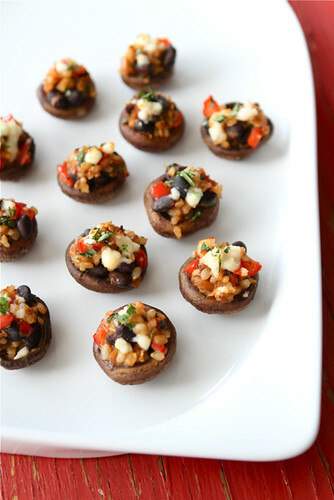 These southwestern stuffed mushrooms, filled with fiber-rich black beans and brown rice, spicy salsa and a touch of creamy queso fresco cheese. These tender, flavorful mushrooms more than satisfied my craving, and I didn’t miss the typical fat-laden ingredients in the least. Baking the mushroom caps for about 10 minutes before adding the filling insures that the brown rice doesn’t dry out. At first, I was concerned that the filling might not be moist enough, but the addition of salsa took care of that, as well as adding another layer of flavor. My husband, who despises all-things fungi, said, “Wow, those look really good…if you like mushrooms, that is.” That’s the highest praise I can hope for from him when it comes to mushrooms. Speaking of my husband, thank you so much for all of your kind wishes for his marathon this past weekend. While he didn’t make his goal of breaking 2 hours 40 minutes (the stars weren’t quite aligned), our boys and I are extremely proud of him. 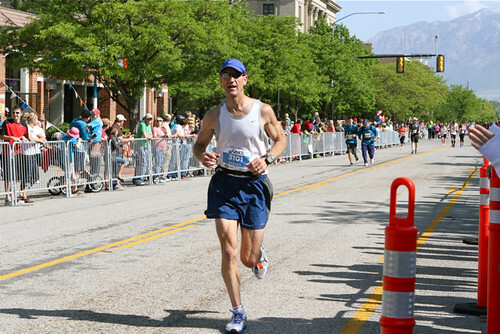 His finish time of 2:49:22 put him in 10th place overall (out of 3000 runners) and made him the third masters runner (40+ age group) to cross the finish line. He’s our hero! 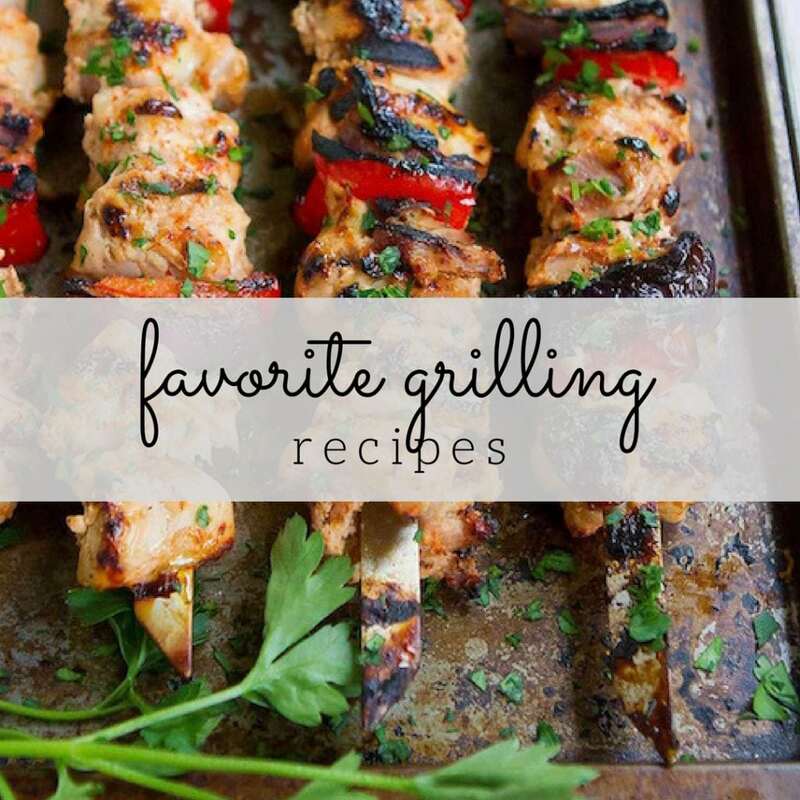 Don’t forget to link up your grilling recipes for a chance at some fun prizes. The link up ends tonight. Remove the stems from the mushrooms (you should be able to pop them out with your fingers). Reserve 6 of the stems. Discard the rest. Coat a baking sheet with cooking spray or oil. Lay the mushrooms, cavity side down, on the baking sheet and bake until the mushrooms are just tender, about 10 minutes. Turn over the mushrooms so that the cavity is facing up. Trim, then dice the reserved mushroom stems. Heat olive oil in a medium skillet set over medium heat. Add chopped mushroom stems, garlic and red bell pepper. Cook, stirring frequently, until mushrooms are soft, 4 to 5 minutes. Remove the skillet from the heat and stir in the black beans, brown rice, cilantro, salsa and 1 tablespoon of the queso fresco cheese. Sprinkle the remaining queso fresco cheese over the stuffed mushrooms. Bake the mushrooms until the cheese is starting to melt and turn brown, 8 to 10 minutes. Serve immediately. Yields Makes 18 stuffed mushroom caps. Bake the mushrooms until the cheese is starting to melt and turn brown, 8 to 10 minutes. A great healthy version of one of my favorite appetizers. Congratulations to Steve, sounds like he rocked the marathon!! So amazing! Congrats to your husband. That’s seriously impressive and you all should definitely be proud. These mushrooms sound super tasty. I think they’re one of my new favorite appetizers to make this year. Cute and crowd pleasing. I’m hoping my next HALF marathon breaks 2:40! 🙂 Congrats to your husband for finishing 10th. That is quite an accomplishment even if he didn’t reach his goal. 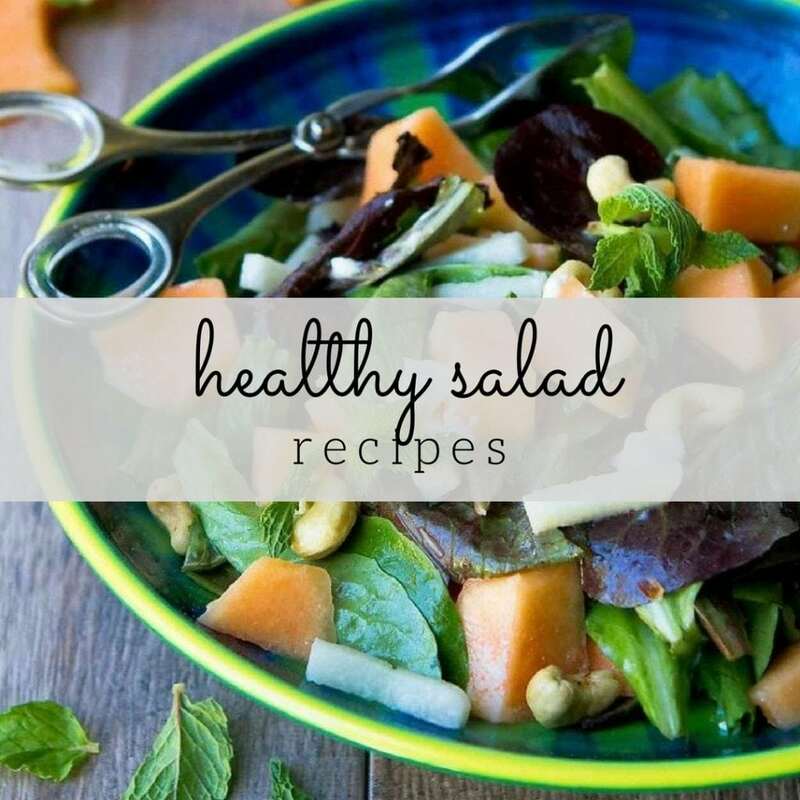 Also thanks to you for coming up with tasty healthy recipes. I need more help in that area of my life! That is amazing timing and he finished in great place! These mushrooms sound fantastic. I might try it by filling in a portobello mushroom cap because I’m too lazy to fill all those little ones individually!. These look great Dara, I love seeing a recipe like this without the tons of cheese usually added. And congrats to your husband! YUM! I am completely in love with all stuffed mushrooms. I can’t get enough of stuffed mushrooms. They have to be one of my favorite appetizers ever. These looks wonderful, Dara. Congratulations to your husband! 10th place out of 3,000? That’s crazy awesome! I love stuffed mushrooms of every kind. It’s about time I made some! Congrats to your husband. No body fat of any kind on that guy!! p.s. Congrats to your hubby … those results are none too shabby I’d say! 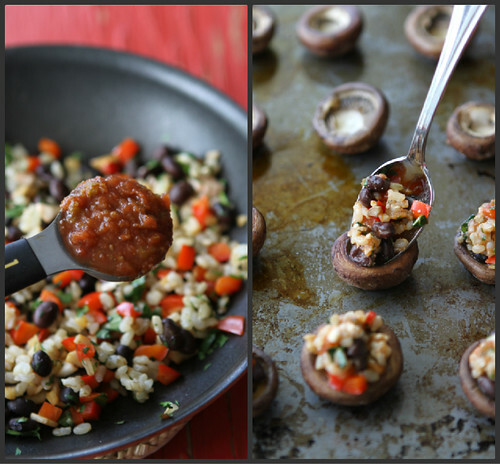 I love stuffed mushrooms, your Southwestern version looks delish! These look so yummy! Definitely going in my “to-make” list. Congratulations to your husband! Excellent job! I’ve got to make these soon. So perfect for a summer party. Congrats to your husband! I just did a post that included my personal history with peppers…and yours made me recall that every time I saw a recipe for stuffed green peppers (I cringe just writing the words!) I would substitute portabella mushrooms for the vessel to be stuffed! I would even include the red pepper, yes, I have come a long way baby! Not as long as that race of your hubs though; much admiration for someone who can do that. What a fantastic appetizere idea, Dara – these look so great and I’ll definitely plan to make them for my next neighborhood happy hour! Thanks for sharing. Also, I’m having a ChicWrap giveaway today that you should enter! 10th place is incredible! Congrats to him! 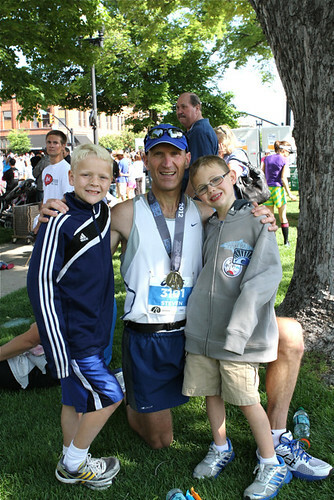 And you–I know that being a marathoner’s wife is a huge sacrifice. My dad ran only one and my mom was at her wit’s end after all the training–and your husband has run multiple races! Bless your heart. The mushrooms look fabulous! I am a HUGE mushroom lover. Y-E-S times a hundred fifty 81. I think your husband has EVERY reason to be proud of himself. I hope he sees past the time he didn’t see, and realizes that he’s made a huge accomplishment by finishing the marathon. Have a great week. Great idea! My husband loves stuffed mushrooms too. I am still wildly impressed that he even tried for 2:40…but yeah, sometimes the stars don’t align and if you want to be a runner forever, you need to accept that. Good on him anyway!!! The stuffed mushrooms sound fantastic, and good job on the marathon. Still a very impressive accomplishment even if he didn’t quite make the goal. Love the picture of him with your boys! These mushrooms sound delicious! I love that you can eat them without feeling guilty. And congrats to your husband – that is so impressive, even if he didn’t quite hit his goal. Amazing! 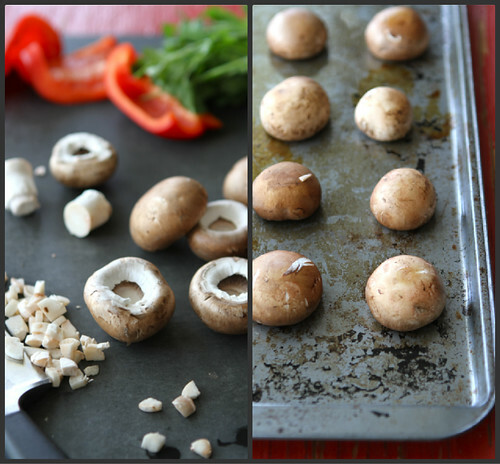 The little mushrooms sure do look like they are packed with great flavor! I can just imagine how great this felt and how proud you are! Congrats to your husband.. your filling looks amazing! Congrats to Steve! What an accomplishment! Stuffed mushrooms are one of my favorite appetizers. Love these! 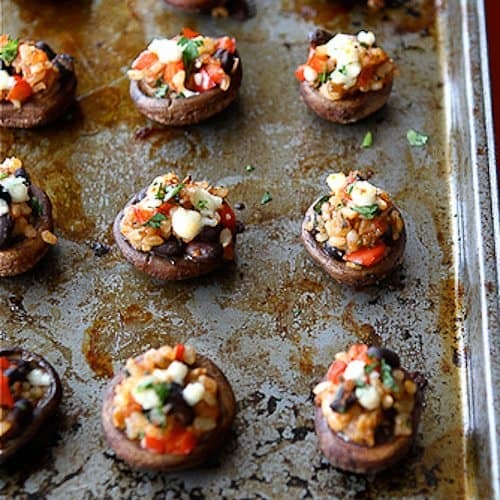 These healthy stuffed mushrooms looks great! These would be perfect for the BBQ on Monday! You may have just saved me from trawling my cook books 🙂 Good job to Mr CC! Love this recipe, and I usually have all of the components on hand. And congrats to your husband! Yay to your husband!! 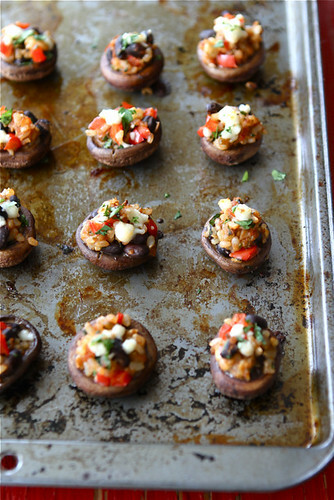 I love stuffed mushrooms so much, as an appy or side dish! 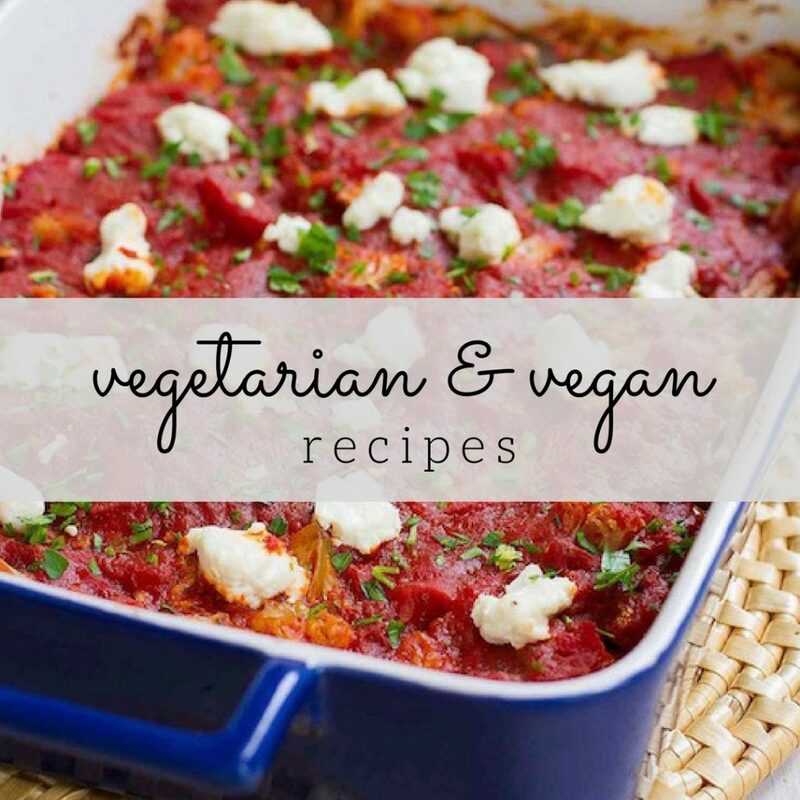 I love recipes that are healthy, but don’t compromise on taste. These looks delicious! I am so impressed with your husband – what an inspiration! The mushrooms look so incredibly tasty – love the southwest flavors. oh I MUST make these! My husband will be ecstatic! !